Zhongzheng District is a local government area of Taipei City, in the Republic of China. Many national government buildings of the Republic of China are in this district. Some are the Presidential office building, the Executive Yuan building and other government agency buildings. 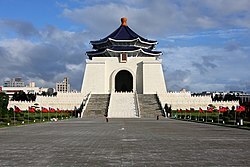 This district is named after the former President of the Republic of China, Chiang Kai-shek. ↑ "About Zhongzheng District". Taipei City Government website. 5 November 2014. Retrieved 26 November 2014. This page was last changed on 26 November 2014, at 20:22.